Snake Repellent - Does it Work? Mothball Flakes The most popular snake repellent products sold, even at reputable places like Home Depot, are usually just napthalene (moth ball) flakes, with some powdered sulfur mixed in. I tried these products many times, and they never once worked. I once poured a half-container of the stuff right down in a den that several snakes were using. They didn't care in the slightest. I tried lining the outside of several yards with it - snakes still came in. I conducted my own tests, with thick lines of this snake repellant, with many different kinds of snakes, and it did not work. Powdered or Liquid Sulfur I've tried both, and neither seemed to work very well. In my own testing, I've found no evidence that snakes take any disliking to the scent of sulfur. Predator Urine The theory with predator urine is that you spray the urine scent of an animal that may like to eat snakes, such as a mongoose or a bobcat or even kingsnake, and this will deter snakes. For years I've used a special blend of urines such as these, and it actually has worked somewhat. But it's not foolproof and doesn't always work, unfortunately. Cinnamon I heard of one type of snake repellent that used heavy doses of cinnamon, so I gave it a shot. Waste of time. Hot Sauce Very hot sauces, like habanero pepper sauce, actually works very well in deterring various animals from chewing on certain areas or going to certain areas. If it's hot enough, it's effectively like mace. It can work on mammals, but I haven't observed it to work well with reptiles. Unfortunately, snake repellents just don't seem to work. I've found that snake prevention, snake removal, and snake trapping work much better. If you want to order something online to take care of snakes problems, don't order worthless repellents. Order a snake trap by clicking the below button. The traps work very well, and are proven effective, unlike repellants. For information about Los Angeles Snake and Wildlife Removal, click this link. Where can u purchase snake repellent - Snake repellent can be found in most general stores in the garden section. Even grocery stores now have a selection for homeowners who want to try something commercial to get rid of snakes. The sad fact of the matter is that there are no reliable commercial products on the market. There are a lot of items with fantastic claims and impressive diagrams on the label, but few of these products have any true efficacy against snakes. If you really want to get rid of snakes, repelling them starts with maintaining your yard at a level where serpents are not tempted to visit. Snake-proofing your property does not mean setting up a fence around the perimeter, though this will work if it is done correctly. A much less expensive route will be to clean up any thick or tall vegetation around your home, and remove any debris that might be an ideal place for snakes to den. The goal is to make your home as open as possible. Snakes will not want to venture through areas where they are exposed to predation. Not only are the snakes uncovered, but no prey will live in short grass. 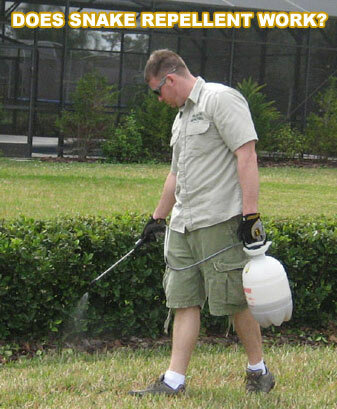 Active snake repellant chemicals - The snake repellants on the market are all the same when it comes to failed efficacy, and the main ingredients are usually naphthalene or sulfur. A few will have natural ingredients like citrus scent or peppermint oil. First, naphthalene, or mothball based deterrents are more dangerous to humans than they are to snakes. Naphthalene is a known carcinogen. Sulfur and the other odorant repellants are ineffective because there is nothing about any of them that raises alarm for a snake. People have long ago lost the ability to define things by smell alone. We tend to enjoy or dislike odors and that�s the end of it. Snakes and other animals use odors for information, and their pleasure or lack thereof toward the aroma is a moot point. Do not waste your time with the chemicals in the store. If you want to keep snakes away from your home, you are better off doing some landscaping modification. By keeping your grass short and your yard free of debris, you are much closer to your snake-free lifestyle than you would be with any chemical bought from the store. Don�t fall for the flashy advertising; you can only keep snakes away if they want to be kept away. Snakes in the house repellent - There are no good repellents available to homeowners on the commercial market. You will find many products available for purchase, but most of these are naphthalene based or have a sulfur ingredient. Neither substance affects snakes in a negative way, or really affects them at all. Snakes inside the home are getting inside through damaged areas or open doors and windows. If you want to successfully repel snakes, you need to repair the damaged areas of your home. Foundation cracks are a particular favorite of snakes. 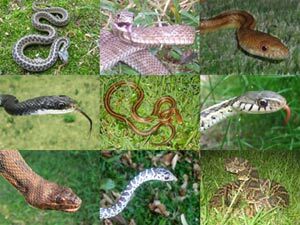 Keeping these animals off your property will be the most important part of your snake repellent process. Even though snakes are very beneficial to your property by keeping down insect and rodent population, the same things that attract snakes will attract other nuisance animals. Pest prevention means keeping your grass mowed. Tall grass locks in moisture within the soil. This might make for a nice lawn, but it encourages insect breeding and will conceal many little critters like snakes and rodents. The snakes want to eat both rodents and insects, so long grass is really your enemy. Other thick vegetation also needs to be maintained. A garden might be beautiful, but it might also be a great place for a snake to escape the sun.